Eugene Towing is a registered reliable towing company with years of experience and offers fair and reasonable prices. It is highly reputable in the towing and auto recovery industry across the State of Oregon. It is also insured, certified and bonded by the Great State of of Oregon. Our mission is to provide our customers with the highest quality of towing and roadside services thanks to our state of the art machinery and tools. Our call center is available around the clock with professional and dedicated customer care representatives eager to help you with any towing emergency. Just tell us where you are and we’ll dispatch a professional mechanic right over to your location to repair your problem or tow your vehicle. Eugene Towing staff members are highly skilled, capable, and ready to assist even on short notice. A tow truck operator can be over at your location within 30 minutes of your call. They are friendly and courteous and have been trained to provide a personal and dedicated service aside from professional services. Some of our towing services include: flatbed tow, long distance tow, junk car removal, heavy duty towing, motorcycle tow, truck tow and more. The roadside services we offer include: jump start battery, flat tire fix, gas delivery and refill, help when your car won’t start and additional emergency roadside services. 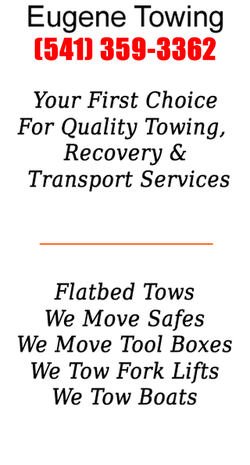 Visit our towing services page to learn more about our wide variety of services. Eugene Towing employes reliable dispatchers to ensure the quickest arrival time possible at the designated location. Eugene Towing strongly believes in the importance of constant maintenance of modern trucks and equipment, and therefore complies with all department of vehicles regulations and requirements.